Denver, Colorado – Mark Fisher, Chief Executive Officer of the Council of the Great Lakes Region (the “Council”), announced today at the Clinton Global Initiative America (CGI America) meeting in Denver Colorado, a working meeting that is bringing together leaders from the business, foundation, NGO, and government sectors to develop solutions for economic growth, long-term competitiveness, and social mobility, that the Council will lead a CGI Commitment to Action to examine the ability of public-private partnerships (P3) at the state, provincial and municipal level to address infrastructure investment challenges with respect to modernizing public infrastructure in the Great Lakes region. The Council, working with a number of partners and advisors in its research, including BMO Capital Markets, the Brookings Institution, the Michigan Economic Centre, Infrastructure Ontario, the American and Canadian Councils for Public-Private Partnerships, the Mowat Centre at the University of Toronto’s School of Public Policy and Governance, and Foster Swift Collins and Smith PC, seeks to elevate best practices with respect to enabling and structuring P3s. The Council of the Great Lakes Region will also identify solutions for capturing and leveraging private investment in public infrastructure in the Great Lakes region. One way that other jurisdictions have done this is through the creation of mechanisms like a cross-border infrastructure exchange. By providing the private sector a role in the design, building, financing, and/or operation of public infrastructure, experiences around the world indicate that P3s offer a viable means of addressing the public infrastructure deficit and investment gap. Potential benefits of P3s include: better project delivery; risk transfer between the public and private sectors; integration of design and construction with financing, operation and maintenance; stronger accountability for the provision of public services; and better sharing of best expertise. P3s also create jobs, support stronger economic growth, and increase tax revenue for government. The Clinton Global Initiative America (CGI America), a program of the Clinton Global Initiative, addresses economic recovery in the United States. 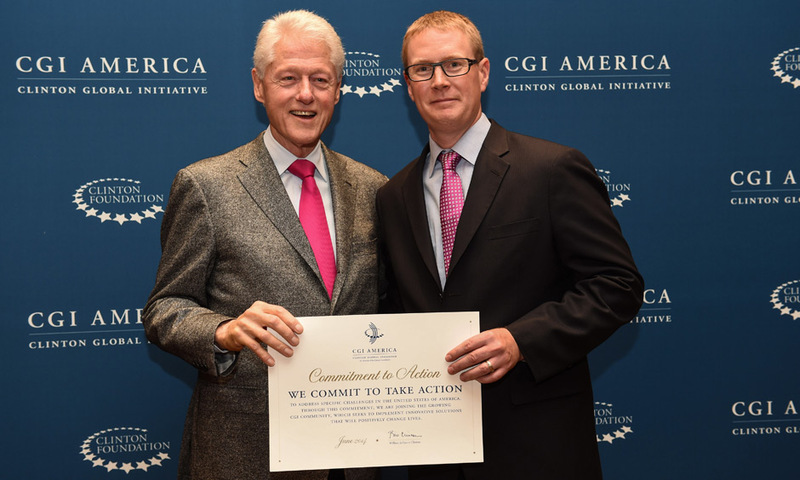 Established in June 2011 by President Bill Clinton, CGI America brings together leaders in business, government, and civil society to generate and implement commitments to create jobs, stimulate economic growth, foster innovation, and support workforce development in the United States. Since its first meeting, CGI America participants have made over 300 commitments valued at more than $15 billion when fully funded and implemented. To learn more, visit cgiamerica.org. Established in 2005 by President Bill Clinton, the Clinton Global Initiative (CGI), an initiative of the Bill, Hillary & Chelsea Clinton Foundation, convenes global leaders year-round and at its Annual Meeting to create and implement solutions to the world’s most pressing challenges. CGI also convenes CGI University, which brings together undergraduate and graduate students to address pressing challenges in their communities and around the world. To date, members of the CGI community have made more than 2,800 Commitments to Action, which are already improving the lives of more than 430 million people in over 180 countries. When fully funded and implemented, these commitments will be valued at $103 billion. For more information, visit clintonglobalinitiative.org and follow us on Twitter @ClintonGlobal and Facebook at facebook.com/clintonglobalinitiative. The Council of the Great Lakes Region is a new bi-national organization that works to enhance regional collaboration and cross-border integration to advance effective, coordinated, and broadly shared responses to the region’s common economic, social and environmental policy challenges. Generating ideas and providing realistic solutions on how best to reconcile often-divergent challenges of economic prosperity and environmental conservation. For more information, visit councilgreatlakesregion.org and follow us on Twitter and Facebook.